RM45TR Mobile Container Truck 200 Litre. The RM45TR is a mobile plastic container with a capacity of 200 litres and designed to provide the ideal storage solution for almost any industry. 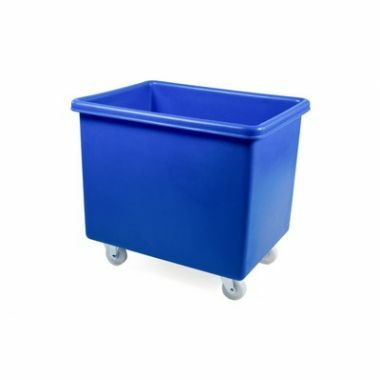 Perfect for use as bottle bins, laundry bins and waste handling containers, these premium tapered trucks are produced from virgin grade polyethylene (MDPE) that has been rotationally moulded. The RM45TR is situated on 4 x 4 inch (100mm) swivel castors to be manoeuvrable, even when full, and can be fitted with a handle for better user control. This plastic container truck is available in a spectrum of colour options and can be supplied with a matching lid. The colours include blue, red, green, yellow and white (natural) which are standard colours. However, a wider range of made to order colours can also be manufactured. These include orange, purple, brown and grey. In need of a black version? 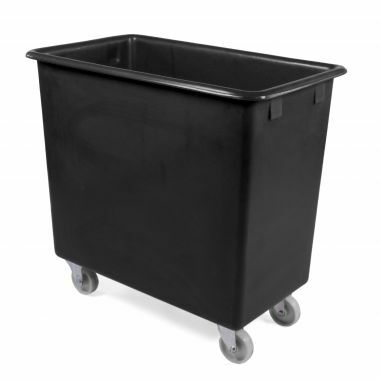 We can also supply this product in black recycled plastic - click here to view the RM45TRREC. The Supertuff range of plastic tapered trucks are rotationally moulded to provide industries with a durable and long-lasting product. The RM45TR has a 200 litre volume and can hold up to 150kg. 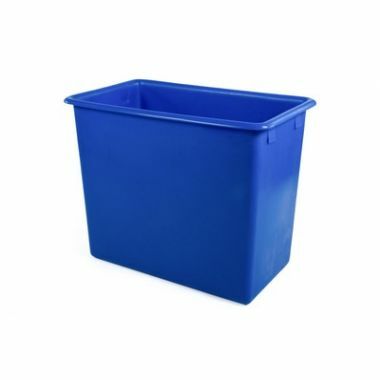 Commonly used as a bottle bin by retail, this container truck can also be used for laundry, ingredient storage, packaging and general waste handling. Manufacturing the RM45TR via a rotational moulding process makes it seamless, watertight and exceedingly resistant to impacts. Without any dirt traps or crevices they are also easy to clean between uses. This mobile container truck is situated on 4 x 4 inch (100mm) swivel castors to provide users with easy manoeuvrability, even when full, and can also be fitted with a handle. A matching lid can also be provided. The RM45TR is available in a wide spectrum of colour options as standard and can be manufactured to many more tones on request.